The UWMS is designed for inline, real time and in situ sampling in high resolution and sets new standards in water chemistry. Now available: Gas standards for hydrocarbons and major gases in water! 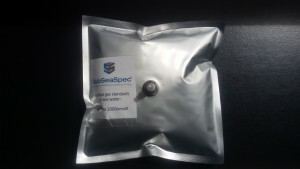 If you need to calibrate a sensor (also insitu) or want to validate your method to quantify dissolved gas in aquatic samples you need a solution of defined gas concentration in water. Instead of time consuming creating and verifying them in your laboratory you can easily use our new standard bags. Our dissolved gas standards in water are stored in gas tight bags and have an Luer lock™ valve for an quick adaption to current tubing. Please do not hesitate to ask for further information regarding to offered volumes, gas mixtures and concentration.